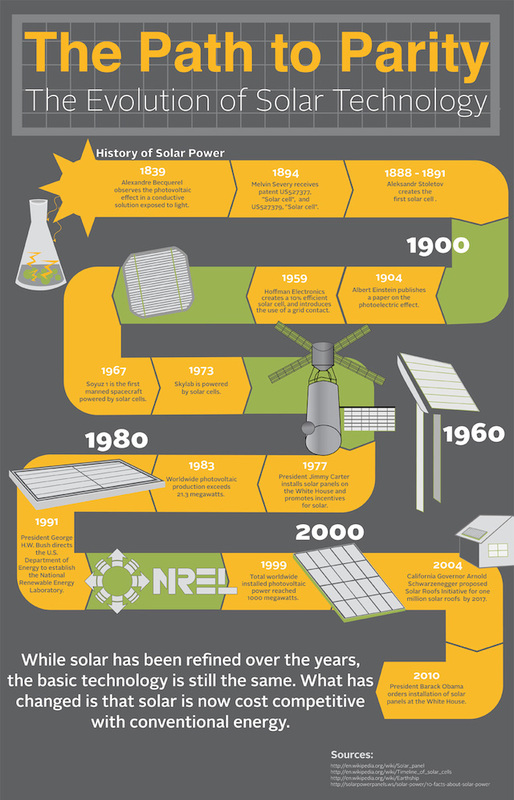 Solar panel technology has changed little since it’s inception in 1894. Certain refinements have increased output and produced higher efficiencies, while the technology surrounding battery technology has improved our ability to store the energy collected. What has really changed is the cost per watt in comparison to the cost of competitive renewable and non-renewable energies. And now, with so many solar companies offering lease programs, the cost of installing solar on your home or business has dropped so significantly, it can often be purchased with no money down and might even drop your monthly electric bill. Of course just saying it doesn’t make it so. Where is the implication otherwise? If you really knew about the solar industry, you’d know that solar power is fast becoming competitive and in some regions is at or near grid parity. Feel free to do your own research on that. Regarding subsidies: I’m not sure what you are basing your comment on, but the fact is that most state rebate programs diminish over time – that is how they are designed. You might take a look at Germany’s FIT or any of the many state programs here in the US. Again, a little research might not hurt. Why no mention of the massive subsidies to fossil fuels? That’s a nice quote by Jefferson. Take it to heart. It seems as if you have some misinformation on solar and the energy sector in general. Huh? What “renewable” technologies are you referring to here JJ that are from the 17th century? Are you sure how tax rebate/subsidy programs really work, or are you basing your opinion an politically biased misinformation? Just curious. It’s a little odd to complain about that while the fossil fuel industry is massively subsidized. But really, I’m just curious about this “17th century” comment. I didn’t think you would be in favor of eliminating the subsidies. Not competitive, I guess. For example, installing a home solar system in Austin, Texas that costs $25,000, the homeowner receives a 30% U.S. Residential Tax Credit ($7,500) and an Austin Solar PV Rebate ($3.50 per watt) ($8,750), so about 60% of the project is subsidized. Even with these generous tax credits, the homeowner can be expect to save about $410 per year at 17% capacity factor. This “sterling” investment pays off in 21 years–hardly a bargain. Their is no such subsidy for a natural gas heating unit. Actually I have no issue with eliminating subsidies. I didn’t think I said that. I can’t speak to the situation in Austin so I assume (for better or worse) you numbers are correct. Subsides will decline in any case as solar costs decline – which they are. You mention a nat gas heating unit. Is the solar system you’re referencing PV?